Halloween garland is a great way to decorate your home or office inexpensively. 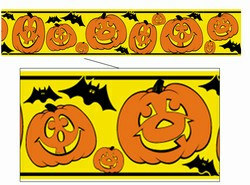 At PartyCheap.com we have several different styles and patterns of Halloween garland for you to choose from. Technically the term garland is defined as “a circular or spiral arrangement of intertwined materials (as flowers or leaves)”. We use the term Halloween Garland to describe all of our products that can be draped, hung, or intertwined to help you decorate your halls, doorways, banisters, or anywhere you want a Halloween decoration. There are many different options to fit your needs. To spice up your Halloween decorations hang the beware tape to add a creepy atmosphere to the party. If there are kids around our Trick or Treat Zone Tape or J-O-L Crepe Streamer will be perfect. Hang the giant spider web at your party to add a small amount of detail that your guests will love. Any one or combination of these Halloween garland's will put the finishing touch on your amazing Halloween party! Our Halloween garland comes in several different materials including art-tissue, metallic foil, plastic, crepe, and all weather poly material. Art-tissue garland is made through a complex process of combining several different very thin layers of tissue paper then lightly glued together in strategic spots. Then it is cut with specific patterns that enable a shape to take form when it is expanded. The Jack-O-Lantern garland is a great example of tissue garland that looks great for Halloween. For as delicate as tissue paper is you won’t have any trouble hanging up this garland. As long as reasonable care is given when handling it and expanding the garland. Other Halloween specific garland examples are the Ghost Garland and Skeleton Garland. Both of these are the little touches that will make your party extra special. Metallic Halloween garland is made of a metallic fringe material that is easily manipulated to wrap around almost any object. It is made of a shiny metallic material that is eye catching without being obnoxious like the Metallic Pumpkin Garland. If you are looking for solid color garland our selection of festooning would probably be your best bet. Festooning is either art-tissue or metallic fringe material attached to a wire core that is flexible enough to adapt to your needs. The most popular art-tissue festooning designs are the solid black festooning, the orange festooning, and the combination orange and black art-tissue festooning. If you want something a little more reflective select the black gleam n fest festooning or the orange and black gleam n fest festooning. You can review all of our Halloween party supplies and decorations in addition to our other fall season of party supplies and decorations.